Dispose of paint properly - Epoxy Paint - Toll Manufacturing | Viking Paints Inc.
Posted on July 7, 2017 by Viking Paints, Inc. If you want to dispose of paint in the proper way, that rules out tossing a can with wet paint into the trash. The paint may end up pouring into your garbage can, spilling inside the trash truck and worse yet, leaking onto roads where it can be splattered permanently on vehicles driving through the spillage. Pouring it down the drain is harmful to the environment. There are, however, responsible and safe guidelines on how to dispose of paint, depending on the type. Calculate carefully and buy only the number of cans you need before your paint project. This will cut costs and prevent having to figure out how to dispose of the extra paint later. You can expect one gallon of paint to cover between 250 and 350 square feet, depending on the condition of the walls and the number of coats you’re applying. When you purchase paint, ask the store about its return policy for unopened cans. When you do have some left over, the last of the can may be just enough to cover a table or shelf. Sometimes the underside of a project needs to be covered and leftovers will do. Small quantities of paint can be combined with other shades when a coat of paint, but not the color, is central. Recycle, recycle, recycle, is a practical way to dispose of paint. Community groups,theater groups, schools and perhaps neighbors may appreciate the offer of leftover paint. Local recycling centers often have an area set aside to share partially full, non-rusted cans of paint. If you decide to dispose of paint in the trash, it must be dried out or hardened. To dry out a can of paint that is less than a quarter full, simply take off the lid and leave it in a well-ventilated place for a few days. 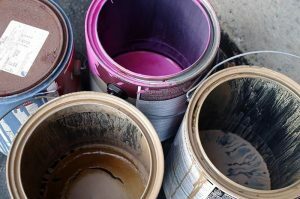 Fuller paint containers can be dried out more quickly by adding mulch, kitty litter, shredded paper or a paint hardener from the hardware store. Follow directions carefully for the paint hardener. With the lid removed, dispose of the dried latex, acrylic and water-based paints. Some municipalities prefer the paint cans to be separated from the other garbage. You can place the cans beside or on top of the trash container with the lid off so the trash collector can see that they’re empty or dried out. There is no need to take latex, acrylic and water-based paints to a hazardous waste collection site, as this costs tax payers money for unnecessary disposal. Some counties recycle paint cans, so check with your local recycling center. Oil-based paint is messier to work with than latex because it doesn’t wipe off easily and it requires paint thinner for cleanup, so you should plan to paint all your projects at once. This will serve your home well and disposal will be made easier when you empty the paint can. Ask around to see if anyone has an upcoming paint project and needs what you have left over. Mention it is oil-based, since some people prefer paint that is water-soluble. If discarding it is necessary, oil-based paint needs to be disposed of at a hazardous waste collection site. The chemicals in oil-based paint are flammable and can be harmful when handled or breathed. Empty cans of spray paint can be thrown away for regular trash pickup. Sometimes aerosol cans are recycled, so check with your local recycling center. If the can still has paint in it but is unusable, dispose of it, along with oil-based paints, at the hazardous waste collection site. If you have questions about how to dispose of paint, call your local waste authority.